We believe that whatever you have done for the least of these, you have done for Christ. We also strive to live the statement of John Wesley: "Do all the good you can, by all the means you can, in all the ways you can, in all the places you can, at all the times you can, to all the people you can, as long as you can." Below is a list of ongoing mission work. Volunteers are always needed! On the 2nd through 5th Wednesdays of each month we serve a meal to 150-200 homeless people at the Church of the Reconciler downtown Birmingham. The meal is generally prepared at Saint Mark. We leave Saint Mark at 8:30 a.m. We begin plating food at the Reconciler at 9:15 and return to Saint Mark by 10:15 a.m. You can contact Richard Green at 205-979-5192 or Kirk Griffin at 205-823-6048 for more information. Highlands UMC Hospitality Hour is served Monday through Saturday from 9:00 a.m. -10:00 a.m. Saint Mark assists with this ministry on Tuesdays and Fridays. This is an opportunity to help those in need and/or homeless in the Southside area. To help on a Tuesday contact Kirk Griffin at 205-823-6048. To help on a Friday contact Debbie Morris at 205-560-0553. On the 1st Monday of each month our Senior High Youth prepare and serve a meal to the homeless at the Firehouse Shelter. If you would like to get involved in this ongoing mission, contact Joshua London at 205-822-5980. 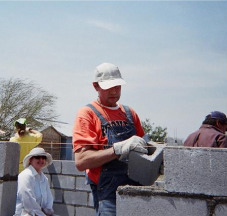 Our mission in going to Mexico is to share the love of Christ, and our task is to build houses for very poor families. The families we serve are selected, and our work is coordinated, by Manos Juntas Mexico (MJM) ministry, in Rio Bravo, Tamaulipas, Mexico. Manos Juntas translates to Hands Together. The work is done for poor families in and around Rio Bravo, which is near the border of south Texas, and is about 60 miles from the Gulf of Mexico. The houses we build are made of concrete blocks, on a concrete slab, with a metal roof, and the new model, first built in 2007, is 12 ft by 20 ft, with a loft at one end. The houses have 2 doors and 2 windows, plus a small loft window, with no plumbing or electricity. We paint the doors and windows and stucco the outside of the houses. Even these simple structures are middle-class housing in the areas where they are built, sometimes replacing or supplementing shelters with dirt floors and no windows. 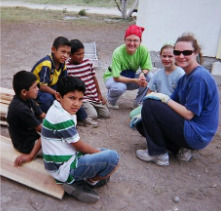 All materials are purchased in Mexico, through the Rio Bravo ministry, and the work is supervised by local working foremen, called maestros, hired by MJM. The Mission Bible School is conducted in the Spanish language, with the help of an interpreter, at or very near our work site, usually Tuesday through Thursday mornings, for children in the neighborhood. Some team members concentrate solely on the MBS, while some split their time between the MBS and construction, and still others do only construction. Also, we all try to spend as much time as we can with the family members, while making sure that the task of building the houses gets done. On Wednesday we try to go to a church service in the evening in Rio Bravo, and we also try to provide a meal for the church community. We go back to visit families from prior years when we can, and sometimes, during one day of our time in Mexico, we go to Nuevo Progreso, a border town, to shop and have lunch. If you would like to learn more, contact John Gaston at 205-823-1750. Belaya Kholunitsa is an orphanage in Kirov, Russia, that is sponsored by Saint Mark and the Children's Hope Chest. Together, we help to provide medical, physical, emotional, educational, and spiritual support for the approximately 60 children there. Each child has a sponsor at Saint Mark and they communicate regularly via mail. Each year a team from Saint Mark visits the orphanage, bringing much joy to each child (and the team!). If you would like to know more about this mission, contact Debbie Morris at 205-560-0553. This is a three-day program at the prison to bring Christ to inmates and prepare them for release. Volunteers may visit prisons and witness to inmates. For more details, contact Toby Baginski at 205-985-8776. Each month on the first Friday, members of our congregation provide a sitting service for members of the community with children with disabilities. We also provide a meeting room for Autism and Asperger's Support groups. The children with disabilities and their siblings come and have recreation, a craft, a snack, computer and a movie. Members of a team provide care once per quarter. If you would like to become a part of a team or have a child that would benefit from this care, you may contact the church office at 205-822-5980 for more information. On the third Tuesday of each month Saint Mark provides a fellowship meal and activity for adults in the community that have special needs. This evening allows their care providers a night off. Each month different Sunday School classes or groups provide the meal and a team provides entertainment or an activity. If you would like more information about this ministry, contact Margaret Alexander at 205-823-2060. One to two times a year the Men's Club goes to Camp Smile-a-Mile to cook and serve a meal to the children who are attending the camp. These children have been diagnosed with cancer, but receive a wonderful respite and fun at the camp. For more information, contact Rick Brandt at 205-822-8042. If you'd like more information, contact the Church Office at 205-822-5980. We have team who tirelessly knit and/or crochet prayer shawls for anyone who needs the warmth and comfort. To join this team, just contact Judy Weismann at 205-663-0200. Care packages and prayers are sent to soldiers who are connected to Saint Mark. If you would like donate packages or help with the mailing, contact Kathy Brandt at 205-822-8042. 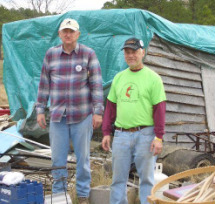 If you would like to help members with personal needs such as minor home repairs, offer rides for doctors’ appointments, help with meals for the sick or shut-ins, etc., contact Linda Crain at 205-980-8698.